As more and more people view presentations on their mobile devices, we want to make sure you, the presenter and uploader, are optimized for the mobile-centric world, too. 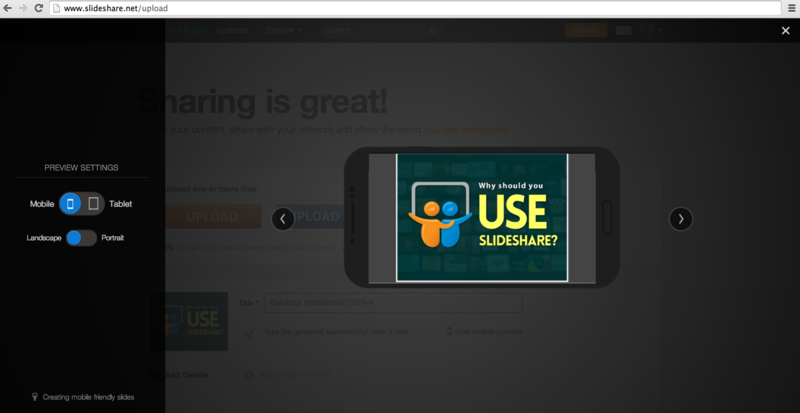 Now, when you upload to SlideShare, you will see a preview of how your SlideShare will look on various mobile devices. Our new Mobile Preview feature will enable you to see how your presentations, documents and infographics will look on phones and tablets. You will automatically see this preview when you upload, and also in your “My Uploads” section. If you don’t like what you see in Mobile Preview, use these tips to edit your SlideShare so that it shines on mobile, too. - Go Big: Use font size 16 or higher. - Say More With Less: Highlight or limit text on slides to a few key phrases. - A Picture is Worth 1,000 Words: Use clear and simple images (limit to 1-2 per slide). - Keep it Simple: Avoid using complicated graphs with too many details. - Use High Contrast Colors: Better contrast improves readability on small screens. Do you like the new mobile preview feature? Tell us your feedback in the comments below.